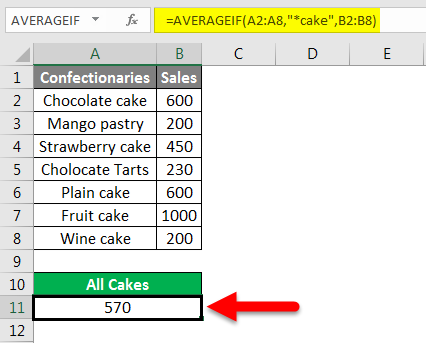 AVERAGEIF in Excel | How to use AVERAGEIF Function in Excel? 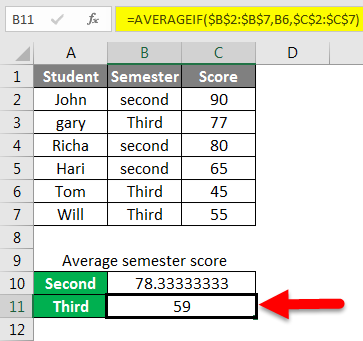 How to use AVERAGEIF Function in Excel? 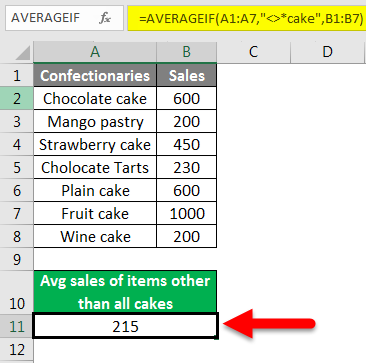 AVERAGEIF function in Excel calculates the average (also known as arithmetic mean) of the numbers in a range after it meets the specified criteria. This function is a combination of average and IF function. It returns the average value of the number in a range of cells on the satisfaction of a condition. This function is a statistical function and can be found under statistical functions under “More Functions” in Excel Ribbon. We calculate the average of numbers in a range by adding all the numbers in the cells and then divide it by the count of those numbers. Example – The average of 2,4,5,9 is 5. The addition of all the numbers is 20, divided by the count of numbers which is 4, will give us the average or arithmetic mean. Now, we have known the exact AVERAGEIF function, we will now learn how to write a formula using function and the syntax of the formula. Here is the explanation of all the elements of the syntax. Range – A range of cells on which the criteria or condition is to be applied. The range can include a number, cell references and names as well. 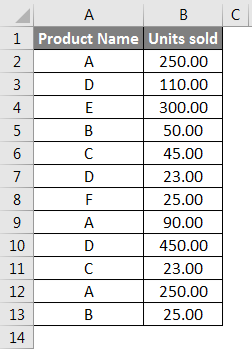 In case there is no “Average-range” argument, this range will be used for the calculation of average. Criteria – Is a condition on the basis of which, cells will be averaged. It could be a number, cell reference, text value, logical statement (like “<5”) or expression. average_range – The cell range to average. It is optional. In the absence of any average_range, range is used to calculate the average. 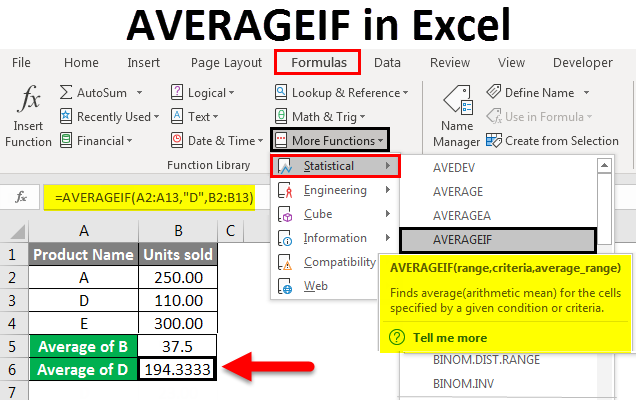 Now, we will learn how to use the AVERAGEIF function in Excel with the help of various examples. 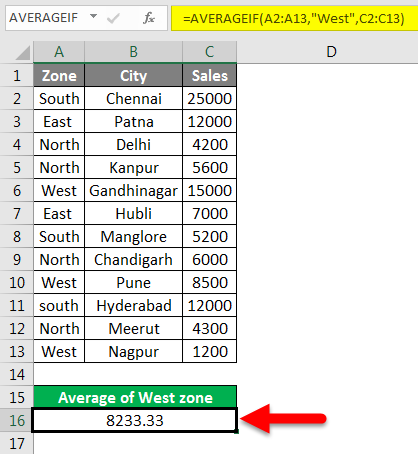 It is an inbuilt function in Excel. 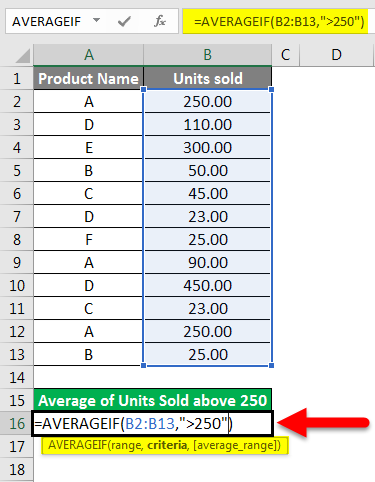 The AVERAGEIF function in Excel calculates the average of cells that exactly match the criteria or the condition specified. 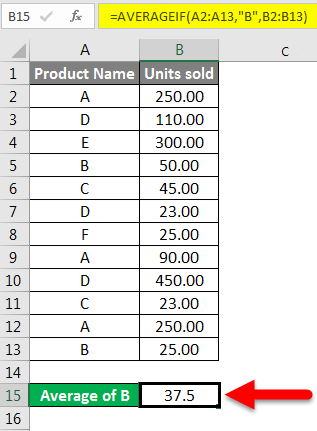 Below you will see a table containing the product name and its units that are sold. 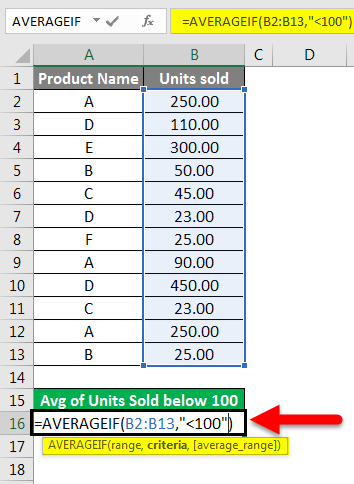 In this example, we need to find the average units sold for product B. Press OK. We get the below result which is the average units sold for product B. Range: We have taken A2: A13 as range, on which our criteria (B) will be applied. 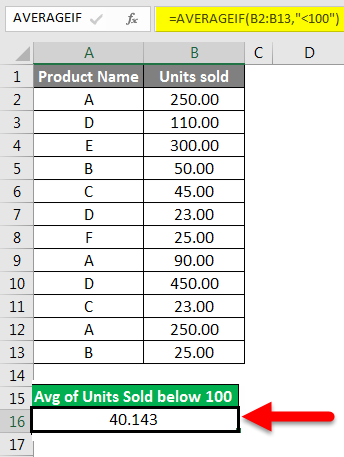 Criteria: Since we wanted to know the average units sold for B so B is our criteria. 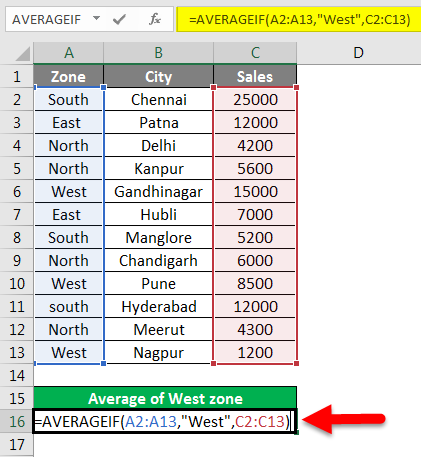 Average _range: B2: B13 is the range of cells from which Excel will do the average. Taking our last example. If we want to know the average units sold for D product. We have a sample data table that contains the score of students for the second and third semester. We will write B2:B7 as range and will make it absolute by pressing F4, then we will write “second” as criteria and C2:C7 as average_range and will also make it an absolute range. 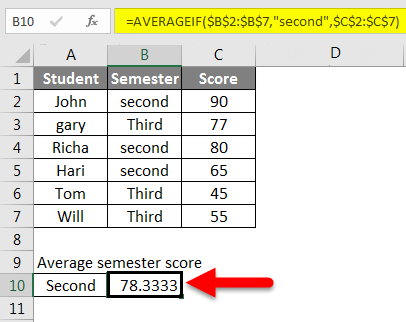 Now, we will get the average third-semester score by using cell reference B6 instead of the word “Third” as criteria. And we will press the Enter key to get the result. 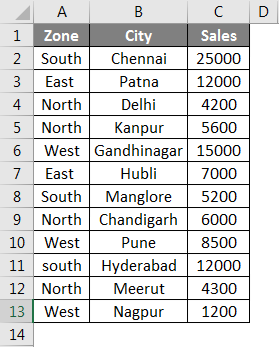 In this sample data, we have sales data for cities of different zones. Press the Enter key to get the result. So these examples must have given you a fair understanding of the use of AVERAGEIF function. We use a wildcard in AVERAGEIF function when the text criteria is partially met or is preceded or followed by any other word. Below is a sample sales data of confectionary items. If we want to know the average sales for all cakes instead of a specific cake, we then use a wildcard(*). Like in our case, the keyword cake is preceded by other words like chocolate, fruit, plain etc. We can overcome this limitation by using asterisk sign before the word “cake” to fetch the sales data of all sorts of cakes. In the same way, we can add an asterisk sign after the search keyword if it is followed by some other word. So we will write the formula as below and will add * sign before our criteria. In this case, our criteria is cakes. After pressing the Enter key, we see the result. 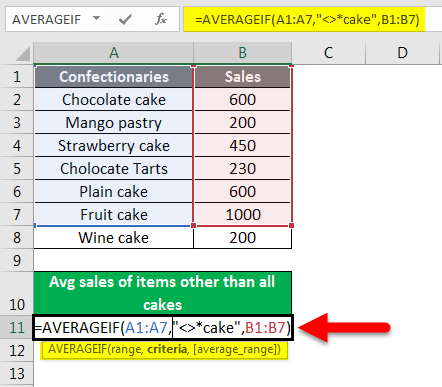 Likewise, if you want to average the sales of all other items apart from cakes, you can use the below formula using a wildcard. Which is “<>*cake”. Many a times we have to average cells based on logical statements like “>100” or “<100”. Or as per numeric criteria. How we will do this? We will understand this with the help of an example. After pressing the Enter key, we will get a result as shown below. After pressing the Enter key will give us the result. This is how we can use AVERAGEIF with logical statements as criteria. If the criteria for calculating the average of numbers is text or logical expression, they should always be written in double quotes. 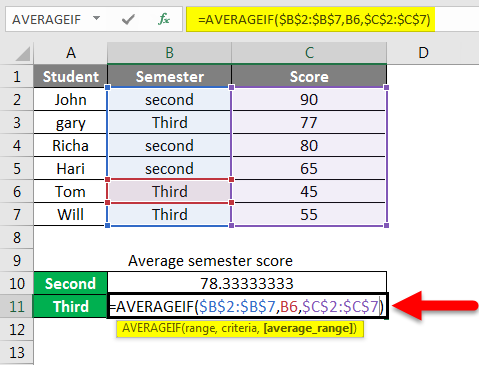 In case no cell in the range meets the criteria for average or range is empty, the function will return #DIV0! Error. 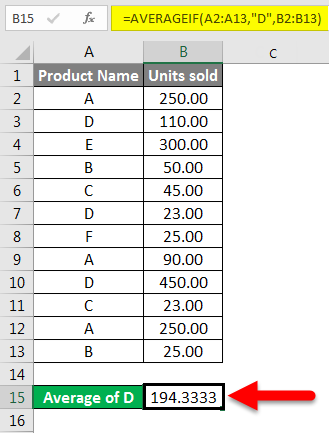 If the cell as criteria is blank, the function will take it as a 0. 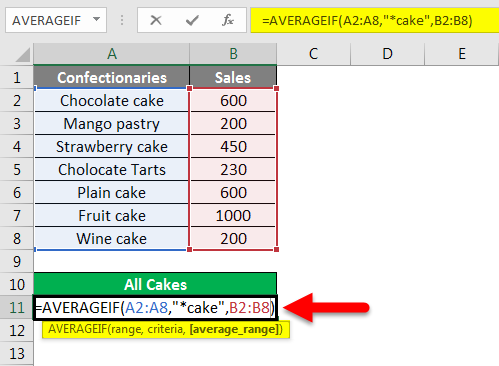 Excel treats the default “criteria” operand as equals to, other operands may include >,<,<>, >=and <= as well. If any of the cells in a range has True or False. The function will ignore it. How to use Excel Square Root Function?